Recently, mobile phones have become a potent vector for the transmission of pathogens. In hospitals, the use of the mobile phones by healthcare workers in an unhygienic manner accelerates the spread of nosocomial infection. We aimed to investigate the prevalence of microbiological contamination of mobile phones belonging to clinicians in Bangladesh hospitals. From 100 samples, we identified 69 isolates of bacteria including 22 Staphylococcus aureus; 11 Pseudomonas aeruginosa; 14 Escherichia coli; 6 Salmonella typhi 6 and 16 Staphylococcus epidermidis. On the basis of antibiotic susceptibility test using 11 antibiotics, it has been observed that most of the isolated bacteria became resistant to antibiotics and compared to other isolates, isolates of S. epidermidis and S. typhi were more resistant and sensitive, respectively. About 68.8% isolates showed that their resistance capacities against ampicillin but in contrast, 56.6% isolated were susceptible to imipenem. 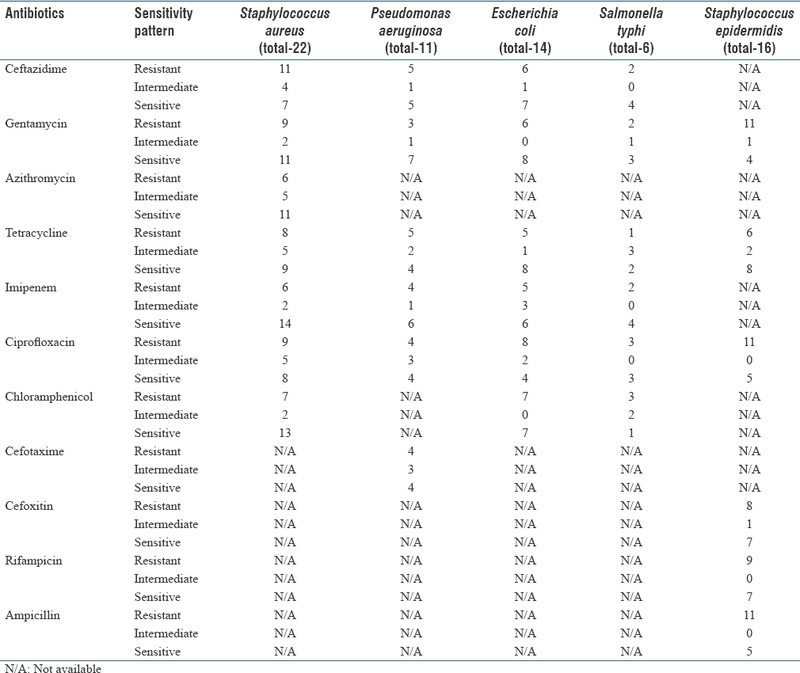 Azithromycin and imipenem against S. aureus, gentamicin against P. aeruginosa, tetracycline and imipenem against E. coli, tetracycline against S. typhi, and S. epidermidis revealed significant antimicrobial affectivity. We found that mobile phones are potential vectors to spread antibiotic-resistant nosocomial pathogens. Based on the study, an effective disinfection practice for cellular phones used in hospitals should be introduced to prevent the potential of cross-contamination. For individual telecommunication, mobile phones are long-range, bearable electronic devices that are radically becoming an essential means of communication worldwide and are common, beneficial and user-friendly. Although mobile phones have more benefits side compare with the harmful side, the cell phones have been identified as one of the media by which bacteria pathogens could be transmitted. They also act as important origins of nosocomial infections among hospitalized patients., A mobile phone can harbor more microorganisms than a man's lavatory seat, the sole of a shoe, or a door handle. Hospital-acquired infections (HAI) appearing more than 2 days after enrollments in hospitals and which do not exist or during admission are generally known as nosocomial Infection. The global burden of HAI is on the rise and contributes significantly to morbidity and mortality of the patients. One-third of all nosocomial infections caused by organisms acquired from a hospital environment are preventable. Contamination of healthcare workers' mobile phones are closely related to the healthcare environment contamination and nosocomial infection. Hands of healthcare workers (HCWs) play a significant role in the transmission of nosocomial pathogens. Mobile phones which are seldom cleaned and often touched during or following the examination of patients without hand washing can act as a reservoir, as well as a vehicle for transmission of nosocomial infections., It is noted that sharing of microbial contaminated mobiles phones within healthcare and non-healthcare workers could spread potentially pathogenic bacteria to the community. The presence of antibiotic-resistant microorganisms on the surface of mobile phones of HCWs in hospitals poses a threat to public health. In developing countries like as Bangladesh, the prevalence of nosocomial infection is very high due to improper investigations and lack of knowledge and public awareness., Although very few studies have reported on mobile phone contamination among HCWs in Bangladesh, the results are not very updated and reliable because the antibiotic resistance pattern of nosocomial microorganisms has changed in the last couple of years. Therefore, we investigated the very recent condition of bacterial contamination of on mobile phones used by HCWs, as well the antibiotic resistance pattern of isolated microorganisms. This cross-sectional study was conducted for a period of 7 months at Noakhali and Chittagong region in Bangladesh. A total of 100 swab samples were collected from the mobile phones of different HCWs in different hospitals by sterile swab that were moistened slightly with sterile physiological saline and rubbed over the entire surface of the mobile phone. Swab samples were then inoculated on nutrient agar and incubated overnight at 37°C for 24 h.
For the presumptive isolation and identification of bacteria, each isolate was further inoculated on a selective medium such as MacConkey agar media, Mannitol Salt agar, EMB, Cetrimide agar media plates, and incubated aerobically at 37°C for 24 h. The isolates were then subjected to gram staining. After that, different biochemical tests such as oxidase test, indole test, urease test, citrate test, triple sugar iron test, catalase, and coagulase test were performed according to the guideline of the Bergey's manual of determinative bacteriology. The standard disc diffusion method was used to determine the antibiotic resistant pattern of the isolated bacteria against commonly used antimicrobial agents. We used 11 broad spectrum standard antibiotics disc including ceftazidime (30 μg), gentamycin (10 μg), azithromycin (15 μg), tetracycline (30 μg), imipenem (10 μg), ciprofloxacin (15 μg), chloramphenicol (30 μg), cefotaxime (30 μg), cefoxitin (30 μg), rifampicin (5 μg), and ampicillin (10 μg). 0.1 ml of McFarland 0.5 suspension of each isolate was spread on the surface of prepared Mueller–Hinton plates, and the antibiotic discs were then placed on the surface of the seeded plates at appropriate spatial arrangement using a sterile forceps. The plates were then inoculated at 37°C for 24 h and observed for the clear zone of inhibition. After incubation, the zones of complete inhibition were measured. The sensitivity patterns were then determined by a calibrated ruler and interpreted according to standard guidelines for clinical laboratory standards criteria. The present work was conducted on 100 mobile phones from HCWs (Healthcare workers) in Noakhali and Chittagong region. The rate of bacterial contamination of HCWs mobile phones in this study was 69%. The isolated bacteria were Staphylococcus aureus; Pseudomonas aeruginosa; Escherichia More Details coli; Salmonella More Details typhi, and Staphylococcus epidermidis. Out of the 22 isolated S. aureus; 11 (50%), 9 (40.9%), 6 (27.3%), 8 (36.4%), 6 (27.3%), 9 (40.9%), and 7 (31.8%) isolates were resistant to ceftazidime, gentamycin, azithromycin, tetracycline, imipenem, ciprofloxacin, and chloramphenicol [Table 1] and [Figure 1], respectively. Similarly, out of the 11 isolated P. aeruginosa; 5 (45.5%), 3 (27.3%), 5 (45.5%), 4 (36.4%), 4 (36.4%), and 4 (36.4%) isolates were resistant to ceftazidime, gentamicin, tetracycline, imipenem, ciprofloxacin, and cefotaxime, respectively [Table 1] and [Figure 1]. In total, 6 (42.9%), 6 (42.9%), 5 (35.7%), 5 (35.7%), 8 (57.1%), and 7 (50%) isolates of E. coli were resistant to ceftazidime, gentamycin, tetracycline, imipenem, ciprofloxacin, and chloramphenicol, respectively [Table 1] and [Figure 1]. Out of the 6 isolated S. typhi; 2 (33.3%), 2 (33.3%), 1 (16.7%), 2 (33.3%), 3 (50%), and 3 (50%) isolates were resistant to ceftazidime, gentamycin, tetracycline, imipenem, ciprofloxacin, and chloramphenicol, respectively [Table 1] and [Figure 1]. Among the 16 isolated S. epidermidis; 8 (50%), 11 (68.8%), 6 (37.5%), 9 (56.3%), 11 (68.8%), and 11 (68.8%) isolates showed resistance capacity to cefoxitin, gentamycin, tetracycline, rifampicin, ciprofloxacin, and ampicillin, respectively [Table 1] and [Figure 1]. Finally, we also estimated the total isolated bacteria among them were almost 45%, 48%, 27%, 36%, 32%, 51%, 40%, 36%, 50%, 56%, and 69% isolates were resistant to ceftazidime, gentamycin, azithromycin, tetracycline, imipenem, ciprofloxacin, chloramphenicol, cefotaxime, cefoxitin, rifampicin, and ampicillin antibiotics, respectively [Figure 2]. From this study, it is proved that antibiotics resistance has been developed vigorously. The percentage of contaminated mobile phones was fluctuated compared to other previous studies., Different types of parameters may be responsible for that including sampling, targeted people, place, weather, methodology, and development of resistance to antibiotics. However, we used 11 commonly used broad-spectrum antibiotics against isolated bacteria from mobile phones of HCWs that are not common in other research works. In our present study, the isolates of S. aureus was most prevalent; which is in concordance with that of similar studies. The isolate of S. aureus can resist dryness and multiply rapidly in warm environments like as mobile phones. In addition, it can cause very sophisticated infections so it can be a dangerous threat in the future world. We found P. aeruginosa and enteric bacteria (E. coli)in this study that were supported by other previous studies.,, Moreover, S. typhi (Non-fermentative Gram-negative bacteria), which is commonly found in HAI, was observed in this current study. This may be principally due to lack of consciousness and low hygiene standards. Mobile phones users usually keep their mobile phones in handbags, pockets or even sometimes place them on contaminated surfaces. Hence, it was not astonishing that some mobile phones appeared with 2 or 3 genera including enteric coliform (for example: E. coli) or nonfermentative Gram-negative bacteria (for example: S. typhi) during this study, which is consistent with the reports of previous studies. Due to multidrug-resistant organisms, nosocomial infection is becoming a complicated matter in many healthcare institutions (e.g. Hospitals)., It has been reported that mobile phone users regularly carry their phones and touch them on average 150 times/day, and it can be a good reason for mobile phones to carry the personal microbiome of their owners. As mobile phones are often used in close to the patients in hospitals, especially in the Intensive care unit and operation theater, these patients have higher risks of nosocomial infections., In other studies, it was predicted that mobile phones can be a dynamic source of nosocomial infection as the use of the hand to hold the phone comes in close contact with strongly contaminated body areas (mouth, nose, ears)., Moreover, almost 30% of the bacteria on the mobile phones moved onto the owner's hands. In fact, due to the use and misuse of antimicrobials in the last few decades, almost all bacteria have been converted from susceptible to single-drug resistant as well as multidrug-resistant. Moreover, these multidrug-resistant bacteria are becoming progressive public health hazard worldwide. Irrational use of antibiotics is one of the most significant factors for the presence of the emerging of multidrug-resistant microorganisms everywhere. Poor drug quality and inadequate doses are also a major reason for emerging multidrug resistance bacteria which are very common in developing countries like as Bangladesh. If this situation continues unabated, some fateful day will come when no dose or level of antibiotic will be effective against bacterial diseases. Since the abridgement of mobile phone use by HCWs cannot be an effective method for the preclusion of nosocomial infections spread, the improvement of efficient preventive strategies for infection control plan is a vital necessity to enclose environmental decontamination, hand hygiene surveillance, and contact isolation for the prevention of such nosocomial infections. In the modern era, mobile devices are a vitally important telecommunication device; therefore, it may not be practical to stop their use even in the realm of healthcare. The best way, rather, to manage this problem could be ultrasonic cleaning by an ultrasonic cleaner which cleans the mobile phones thoroughly and safely. In addition, the use of 70% isopropyl alcohol or antimicrobial additive materials can be efficient cleanser in alleviating the risk of cross contamination. The overall implication of these results is that antibiotics resistance is increasing day-by-day, especially in healthcare, where even the mobile phones of healthcare workers are not only spreading susceptible bacteria but also spreading multidrug-resistant bacteria causing dangerous nosocomial infections. If preventive care is not taken, some fateful time will come when no dose or level of antibiotics will be effective against bacterial diseases and mobile phones could also be vehicles for the transmission of biological threat agents. Our findings demand a comprehensive approach to minimizing nosocomial infections, which promotes proper hand hygiene as well as the maintaining the cleanliness of mobile phones. Finally, further research is applicable to provide evidence that better mobile phone hygiene will protect the spread of nosocomial infection. We are grateful to all nurses, nanny, and physicians who participated in the study. We also grateful to the Department of Microbiology in Noakhali Science and Technology University and Ma-O-shishu hospital, Chittagong, for their support. Selim HS, Abaza AF. Microbial contamination of mobile phones in a health care setting in Alexandria, Egypt. GMS Hyg Infect Control 2015;10:Doc03. Famurewa O, David O. Cell phone: A medium of transmission of bacterial pathogens. World Rural Obs 2009;1:69-72. Tambe NN, Pai C. A study of microbial flora and MRSA harboured by mobile phones of health care personnel. Int J Rec Trends Sci Technol 2012;4:14-8. Ducel, G, Fabry, J, Nicolle, L and World Health Organization. Department of Epidemic and Pandemic Alert and Response. Prevention of hospital-acquired infections: A practical guide/editors: Ducel G, Fabry J, Nicolle L, 2nd ed. Geneva, Switzerland: World Health Organization 2002. Pal S, Juyal D, Adekhandi S, Sharma M, Prakash R, Sharma N, et al. Mobile phones: Reservoirs for the transmission of nosocomial pathogens. Adv Biomed Res 2015;4:144. Ulger F, Dilek A, Esen S, Sunbul M, Leblebicioglu H. Are healthcare workers' mobile phones a potential source of nosocomial infections? Review of the literature. J Infect Dev Ctries 2015;9:1046-53. Rimi NA, Sultana R, Luby SP, Islam MS, Uddin M, Hossain MJ, et al. Infrastructure and contamination of the physical environment in three Bangladeshi hospitals: Putting infection control into context. PLoS One 2014;9:e89085. Chowdhury MM, Kubra K, Islam MT, Rahman MM, Mehedy ME. Indiscriminate uses of antibiotics as a threat to public health demand implementation of effective drug practices and enhancement of public awareness in Bangladesh. European Journal of Scientific Research. 2015;133:187-95. Samanipour A, Dashti-Khavidaki S, Abbasi MR, Abdollahi A. Antibiotic resistance patterns of microorganisms isolated from nephrology and kidney transplant wards of a referral academic hospital. J Res Pharm Pract 2016;5:43-51. Buchanan RE, Gibbon NE. Bergey's Manual of Determinative Bacteriology. 9th Edition, Williams and Wilkins Co., Baltimore. 1974. CLSI. Performance Standards for Antimicrobial Susceptibility Testing; Twenty-Second Informational Supplement. CLSI/NCCLS Document M100-S22. Wayne, PA: Clinical and Laboratory Standards Institute; 2012. Bhat SS, Hegde SK, Salian S. Potential of mobile phones to serve as a reservoir in spread of nosocomial pathogens. Online J Health Allied Sci 2011;10:14. Mark D, Leonard C, Breen H, Graydon R, O'Gorman C, Kirk S, et al. Mobile phones in clinical practice: Reducing the risk of bacterial contamination. Int J Clin Pract 2014;68:1060-4. Raghavendra M, Shruthi K, Shivalingaiah B. Bacteriological screening of hands and mobile phones of healthcare workers and its management. Int J Recent Trends Sci Technol 2014;1:92-7. Trivedi HR, Desai KJ, Trivedi LP, Malek SS, Javdekar TB. Role of mobile phone in spreading hospital acquired infection: A study in different group of health care workers. Natl J Integr Res Med 2011;2: 61-6. Waness A. Revisiting methicillin-resistant Staphylococcus aureus infections. J Glob Infect Dis 2010;2:49-56. Nwankwo EO, Ekwunife N, Mofolorunsho KC. Nosocomial pathogens associated with the mobile phones of healthcare workers in a hospital in Anyigba, Kogi state, Nigeria. J Epidemiol Glob Health 2014;4:135-40. Meadow JF, Altrichter AE, Green JL. Mobile phones carry the personal microbiome of their owners. PeerJ 2014;2:e447. Jeske HC, Tiefenthaler W, Hohlrieder M, Hinterberger G, Benzer A. Bacterial contamination of anaesthetists' hands by personal mobile phone and fixed phone use in the operating theatre. Anaesthesia 2007;62:904-6. Elkholy MT, Ewees IE. Mobile (cellular) phone contamination with nosocomial pathogens in Intensive Care Units. Med J Cairo Univ 2010;78:1-5. Tri JL, Severson RP, Hyberger LK, Hayes DL. Use of cellular telephones in the hospital environment. Mayo Clin Proc 2007;82:282-5. Okeke IN, Lamikanra A, Edelman R. Socioeconomic and behavioral factors leading to acquired bacterial resistance to antibiotics in developing countries. Emerg Infect Dis 1999;5:18-27.